Do you have an AdSense Account? Have you clicked on your own AdSense ad accidentally? Calm down and don’t Panic. There can be many instances when we click on our own Adsense ads by mistake or for fun and then we realize that we did a mistake. If it was just one or two clicks, then don’t worry about it. Although Google requires it’s publishers to report any accidental clicks or invalid activity on their account but that don’t count for every once in a while accidental click. 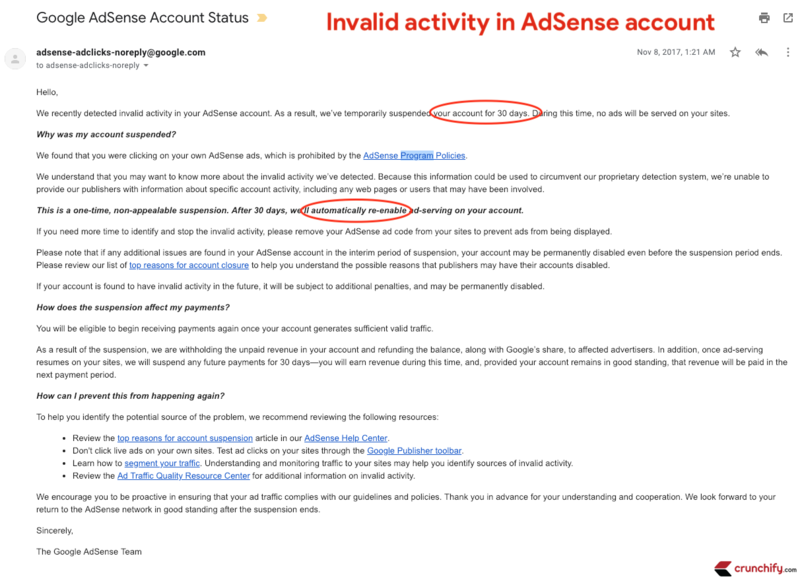 Their system is already checking for any invalid clicks or activity on your Adsense account and chances are that they will remove those clicks from your total at the end of the month / payment period. So don’t worry if these clicks still show in your earnings on AdSense. Just don’t try to click your ads daily. If Google detects some invalid activity then they may warn you and disable your account for 30 days as a notice. Please be kind and follow Google Policy Guidance. I would suggest and ask you to think about long term revenue than short term. Google Adsense is no doubt the best Revenue making program out there and be proactive in ensuring your ad traffic guidelines and policies. Once 30 days over Google Adsense System will enable your account again automatically. You don’t have to request or contact Google again for the same. Because we closely monitor all account activity using engineering systems and thorough human analysis, chances are we’ve already detected your clicks on your ads and discounted them. While these clicks still show in your reports, we filter out their associated earnings so that advertisers aren’t charged. However, please keep in mind that we don’t ignore the clicks completely; if it appears to us that a publisher has been clicking on his own ads to inflate his earnings or an advertiser’s costs, we may disable the account to protect our advertisers’ interests. …. I would highly encourage all users to visit these invalid traffic and policy violation and Accidental clicks articles. As a summary: if you see or feel fraud clicks activity by yourself or some one else, please report it to Adsense, before they block your account. Woah my heart become calm down. I panic when i click accidentally my ads, “Woaaaahh, what should i do ? wtf, oh god what should i do ?! !” when i read your explain, woah this heart become cool just now. Aaha! Happy to help. Happy blogging and keep earning online using Google Adsense. I clicked my own ads while working on my website to see whether ads are placed correctly or not. After reading this article, I am very confident that adsense won’t block my account. Thank you for this article. You are welcome Faith Biete. Yeah, for couple of links Adsense doesn’t care much as usually human error happens. But if Adsense algorithm finds some pattern about ad click then definitely, it puts account into consideration.